Vlasis Kaniaris (1928) is a particular case of an artist whose art is based primarily on social and political stimulants. After 1960, His "prime matter", social reality, invades his work -similarly as it happens with Neo Realists- and defines, as we will see, the social and political time of the creation of his work. This invasion of reality, that inspires the artist, turns into an artistic object through the materials. Vlasis Kaniaris, during his short but substantial stay in Rome in the end of the 50s, exhibits the series of Wire fences, works that abolish the painting act by expanding into space; this is his most complete personal and historical stance, since these artworks underline the problematic of the quality of the artistic gesture and the painterly form, a recurrent subject in abstract art. Along with Giannis Gaitis, Dimitris Kontos, Nikos Kessanlis, Kostas Tsoklis he creates the group "Sigma" and in 1969, despite the advice he gets from his art world peers to head to America, he decides to go to Paris instead. It is the year that Yves Klein presents his Anthropometries, the year when, on October 27th Pierre Restany along with Arman, Dufrêne, Hains, Klein, Raysse, Spoerri, Tinguely, Villeglé presents the foundational act of the neo-realism. In 1961, while still in Paris, he participates in a group show in St. Germain Gallery, along with Koulentianos, Gaitis, Molfesis, Kessanlis, Filolaos, Prasinos, Tougias -according to the information we get from his personal archive- whereas at the same year he participates in Salon des Comparaisons and the Salon des Réalités Nouvelles. In 1962, the artist participates in the show organized by Giorgos Mourelosi in Musée d' Art Moderne de la Ville de Paris entitled Peintres et Sculpteurs grecs de Paris, where works by Andreou, Karas, Kontos, Koulentianos, Daniel, Gaitis, Sklavos, Tougias, Tsoklis, Xenakis, Filolaos were also presented. Since the 1960s Vlasis Kaniaris' work is characterized, as Emmanouel Mavromatis notes, "by the search of a methodology to approach the environment of the contemporary world. At the same time his work didn't aspire in creating an ideal reality, as is usually the case with representative painting, but in expressing the material aspect of an idea"ii. 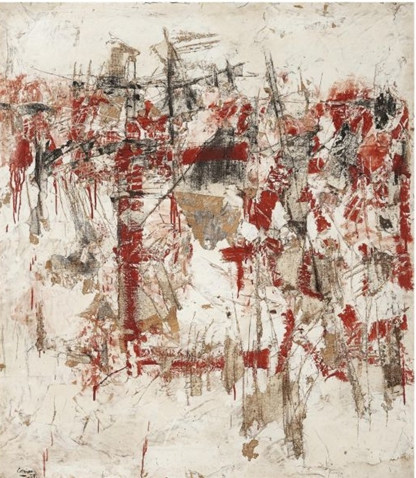 This is evident already in 1959, with works such as Walls, where the artist distances himself from the two-dimensional surface of the canvas. The materials -plastered papers or fabrics, metallic bars and colors- resonate, through the intense relief, the perception of the walls in Athens during the German Occupation. The writing and rewriting as gestures define the very materiality of painting. The artist, by using different layers of colors, writings and material, gives the diachronic narration of "history" in a compact way. It is important to say that, although the works are not walls, but structures built upon canvas, materials such as ground, wall, plaster, and dust as well as the procedure followed, that is, the layering, remind us the reality of wall. The material used in this period, mostly locomotive, forebode the artist's disposition to outline the intensity of gesture. Through a spot system, which includes the complexity of gesture, we see an abstract approach that uses the material as a stimulant in order to approach problems of form and shape, like for example the descriptive perception of the social reality. Later on, the artist notes "...I got rid of the frame in order to limit the freedom I had before and mostly because the frame introduced an abstract sense of space, whereas "painting" is a real object..."iii. Vlasis Kaniaris, detached from the traditional painterly perception, turns to the depiction of social reality, using the reality itself and its objects as painterly means. At the same time, Neo Realism, a movement that marks the era, makes its appearance; in the Second Manifesto, in 1961, Pierre Restany, a theorist that represented the movement, notes that the "Sociology comes to the assistance of consciousness and of chance, whether this be at the level of choice or of the tearing up of posters, of the allure of an object, of the household rubbish or scraps..."iv. The everyday object is presented as in the real world, without any aesthetic embellishment. Kaniaris detaches himself from Neo Realism, because he believes that it cannot constitute a complete movement, since there is no sociological dimension in art and no interaction with the new expressive system of the industrial landscape. In 1961, in need of turning towards the surrounding social space, the artist, who has a Left conscience, organizes and constructs images that come from this space and are created within it. As a result, through compositions and assemblies of material he organized a presentation of objects and situations in time within a certain time moment; using real materials and a human scale, he created mostly urban spaces. In 1960 he exhibits the series Space within space in Tartaruga Gallery in Rome, along with the Walls. In 1964, during the exhibition 3 propositions for a greek sculpture by Kaniaris, Daniel Nikos in the La Fenice theater in Venice, Pierre Restany writes in his introductory text "it goes without saying that the 3 Greek artists who present their 3-dimensional works are relevant to my theory of subjective appropriation. But they are not neorealists in a strict sense. Because, if Kaniaris, Daniel or Nikos all share, in a different manner, a new sense of contemporary art (sociological, industrial and urban), the research of language remains tied to a specific cultural position". And he adds that "these painters have nevertheless become sculptors, composers or, to be more accurate, directors of hope. The deep sorrow of their art is the image of their own agony and their doubts. The apparent misery is soaked with an unchanging presence, the sensation of a radiant human warmth. We feel solidarity with these costumes for Beckett heroes, these shadow play theaters at value price, these super market white clothes, whose folds include nothing but the void"v.
We should note that due to strikes in Italy, the works of Daniel and Kaniaris never arrived, therefore, they created works in situ for the first time: Kaniaris created Faces-Objects and Daniel The Boxes. The work, that was destined for Venice, is a space where second-hand everyday objects, with a realistic or an anecdote touch, as a hung old woman coat, a small waistcoat with a medal, or a ribbon with the colors of the French flag, suggest a massive production, that has lost any usability; through circular time these objects depict human loneliness. Simple and poor materials -like the ones used by arte poveravi- recycled, introduce a social and cultural dimension and sense, whereas through their displacement into another space, these non-aesthetic objects get incorporated into the new space, outline it, acquiring thus a new semiotic function. A function that evolves through the new way of using these materials, since each material acquires a special meaning through its relation to the other and their relation to the two-dimensional or three-dimensional space. We should note that the artist, through this neo-dada approach, doesn't seek neither to produce a new poetic object nor to embellish the material itself. The prime materials, worn clothes, sacks, barbwire or consumer goods trash, carry their semiotic sense, but at the same time underline, through the new composition, a new connection between the images that each object separately suggests. This way, every material gets a new sense through its relation and its connection with the others, maintaining at the same time its autonomy as a material. From 1959 and onwards the work for Kaniaris is no longer an artwork or an intention to create an artwork, therefore he experiments with materials of every type. The anonymous social dimension of the work brings forth social protest -indicative of the period- because Kaniaris does not just register reality images, but participates in the change of this reality through the social environments. Since 1960 the work of Vlasis Kaniaris, who goes back to Greece in 1967 but returns to Paris two years later due to the dictatorship in Greece, is characterized by an intention to "make the procedure of the artwork visible, to bring forth the unconstrained and direct artistic experience, to help, finally, material acquire its conceptual entityvii", that is, its consistency. These things occur very often among the artists of the 1960s. The artistic images are foremost images based on "materials of ideas or the transcription of ideas in visual systems"viii. In 1964, Kaniaris' doll exhibition in "J" gallery, and his participation in the Venice Biennale, practically define his research on materials. We should note that the artists in this period seek to exalt these everyday objects into objects and means of theoretic development. In other words, there is a conceptual extension within his work, where the composition of materials don't seek to state a reality, as is the case with representational painting; on the contrary, the rags, the strings, the objects, as are presented in the 1962 dolls, compose an image based on the statement of an idea, a sense of its materiality. And by image, we mean the sum of these elements (real or not) that help the visual composition represent or present a real or unreal object. Scattered into Kaniaris' space, the image-objects, which were created from 1964 to 1969, are not a technology reproduction, as is the case with works by the neorealists at the time, but the enouncement of a painterly way of expression, which is subversively stated in space; the color here is used as an independent object and as a representational element. Another important axis is the profound realism, because it defines not only the artistic work and the material, but it also constitutes the work structure. In other words, the structure of the real space. The material assemblies -grids, plastered fabrics and papers- define, through the metallic bars that cross them, the dynamic structures of a social and physical space, whereas the material, the grids in this case, include and incorporate the space and the void, elements that in turn constitute the image. Images in space, headless puppets, stiff tights, wire frames, in the human scale, inspired by his personal experience as a foreigner, an "intellectual immigrant": Kaniaris understands art as a social means of communication, whereas he tries to recall the ghastly material and intellectual reality of bodies. The social and political state of the period is something that preoccupies him not as a simple observer, "the social environments appropriate pieces of this reality"ix. This is particularly evident in the period 1969-1970, in the immigration series, which he works in Paris and presents in Berlin in 1972; through this work the artist turns his interest towards the problem of the mass immigration of the workers, especially the ones that come from mediterranean countries, a political, financial and social problem of the 1960s. The plastered gauzes, the metallic grids that wrap around them acquire a meaning that serves an idea. In the work Image, that was presented in the George Pompidou Centre in the exhibition, Face à l'Histoire, 1996, the used suitcases, tied with string, are placed in parallel to the public-private space of some immigrant, which is defined by the newspapers that are symmetrically spread around and the two crates that are placed in and out of the surrounding space. His images now come from the life of the immigrants; with the objects of everyday use and of the environment he registers the lifestyle of a group that remains faithful to the idea of origin, whereas at the same time every mentioning to origin is abolished, since there's no element to define the place of origin or the place where they immigrate to; as a result these images are images of each one of us. The structure of space within the architectural space and the viewer's freedom to move in these environments underlines the artist's wish to involve the viewer in the social matter with a humanist disposition, this matter that was so important at its time and still is so up to date in our time. During the 1980s, starting with the exhibition in Bernier Gallery, Kaniaris turns from the political and the social towards the anonymous. In the destroyed space of an old factory, people-puppets chat, read, do the laundry. In the three levels where the work is developed, we see the political culminate, through the hung press; at the same time a group of people seem to talk, whereas in the entrance, near the celebrities there is a female figure placed like in a Manet painting, leading to the Loo of History; in the second level Kaniaris hangs the laundry that got dry by the breath of the visitors, whereas in the third level the observers watch what's going on; in a symbolic way this underlines, firstly the facts, our tendency to recycle ideologies and and our participation in the social and political web and secondly the simple observers of a society in progress. In this work, Kaniaris follows Velásquez's logic in his work Las Meninas; the painter with his back turned to the viewers paints his model, which is why he called it Alas Greece or The painter and his model. In this work, through the content of the image, where the image is the only real element, the anonymity of everyday life underlines painterly act and how it can be reproduced in the real space. Of course, in this case, the materials remain the same, so it just emphasizes a mise-en-scène where the objects are placed in a way that stresses the social meaning. Pierre Restany's view that aesthetics lean towards ethics and that ethics is documented through the social and political stance of the artist still remains up to date. Kaniaris' work subverts every approach of shape and form in favor of a pure depiction of the social environment. What interested him and still does is the structure of the real space and the use of materials, so that the issues of the social and political environment are underlined. These subjects depict the material, social and class condition, often organizing a kind of narrative visuality, which is not the registration of the duration of time in the canvas -as defined by Gassiot-Talabotx, in his text for the exhibition La figuration narrative dans l' art contemporain- but the registration of the duration of the cyclic time, so that the social element centered upon the human being remains timelessly present and includes the visual act itself as a basic ideology. Throughout the artist's work from 1962 and on, space and its organization through materials of every kind appears as a special parameter of structural composition. In his early work, when he was still in Athens and Rome, the two-dimensional work of the artist is structured through materials, like the collage and the gestural writing; it is a kind of staging of the materials that define space. "They're painterly mise-en-scènes combined into one, main, conceptual relation, illustrations, depicted as complete painterly works and an architectural structure of the environment"xi. Studying materials, stone, sand, paper, etc. made the artist use them in a way that underlines a frontal reading; on the other hand he was obliged to organize space in a way that through the architectural structure of the materials the volumes of the materials stand out and the void of space is implied by the overlay of the materials. The interest of the artist for space and mostly architectural space is manifested though his works Study, 1956, or Study (Athens), 1956, where, despite the neoclassical representation of the architecture of Athens, we observe that the parallel, multiple layers, define a scene that abolishes perspective by favoring the repetition of levels; as a result the reading is developed frontally and not through the volumes of the figures. In 1960, when Kaniaris constructs the series Space in space, he stages materials in such way, so that the metallic frame, the plastered papers and the metal bars occupy and suggest a non-infinite space, a space that defines and is defined by materials. In 1964 in the Fenice Theatre in Venice "Kaniaris' bride, a huge doll dressed with clothes from italian bazaars"xii occupies the empty space in a theatrical manner and at the same time limits it, defines it through the wooden ladder, that makes this composition an urban, subversive image. The manufacturing of images, based in a realistic perception of reality, is not new in art history; it is more like a classical function also present in constructivism and cubism, where non-painterly elements claimed their independence. In this work work material-objects like the chairs, the electrician's ladder, came about randomly, were just objects in space; this gave the artist the opportunity to use them as an endless gesture that is not inscribed in the two-dimensional surface, but the three-dimensional space and that leaves its "imprint" through the way the materials occupy space. During the 1970s Kaniaris moves from objects to environments; this period is defined by works that have the characteristics of a mise-en-scène where the viewer is called to act and react, a way of interaction. With the works Immigrant Workers - Foreign Workers, 1971-74 and Alas, Greece, 1980, we observe the artist's need not to differentiate the staging of the work from its presentation to the viewer. The artist creates an "environmental theatre", where on staging the idea with his materials -mannequins, dolls- he gives them the same conceptual meaning that theatrical costumes have, a compact sense of myth, like in a tragedy, whereas at the same time he no longer differentiates the work and the environment from the viewer; he places them in the same place and space, so that all spaces are included in a dynamic way and all aspects of reality are over-emphasized. A reality that is included into our own and is dependent on the subjective Ego, whether it is the artist's Ego, or the viewer's. During same decade the new theatre in America, Germany and France seeks a different, direct relation to its public. Kaniaris, as a director and writer at the same time, stages the same idea. From Immigrants and Alas Greece to North-South, 1988, suggests the crisis of meanings that characterize the crisis of modernity, the crisis of society and its objects. In the environments the space and its lifeless figures are separated from every psychological reference, whereas, in a oxymororous way, it is developed without an incoherent internal dialogue, like the words in Beckett's workxiii.. The human condition in the social space, becomes the symbol of a metaphysical agony of the artist. The impersonal, anonymous dolls function as a theatre of the absurd where the gesture of the artist is the soul and the dramaturgy, the words, the entity of each environment, the lines and the color that comes from the structure is what creates the very existence of the whole structure, the "decoration" of a realistic depiction of reality; meanwhile, the rhythm is carried out by the viewer, that moves within the architectural space, defines it and is defined by it. At the same time, the way the artist installs and creates within space, in environments such as Where is North and South, is such, that the layout of the dolls, in a natural scale, is vertical and parallel, in order to create the impression of the foreground and the background; in other words, the structure creates a system of representation of the imaginary lines, whereas the back surface, the painting with the color, gestural layers, functions as the mise-en-scène of the environment, as a painting that includes another painting. Kaniaris, through a special dramaturgical use of materials, makes the mannequins the center of a microcosm, where the person and the World suggest a kind of new-anthropocentrism where contemporary human being is still in a personal space, overstressing thus the public character of the personal and private life. The "theatrical environments" include the steadiness and the inquietude of a theatrical act, where the bilateral relationship of work and player that characterizes his work since 1959, undoubtedly acts as a mirror of reflection of a society of control.